This calculator will help you when budgeting for a wedding by allowing you to create your own self-calculating worksheet -- either from scratch or from a sample wedding budget. You can include up to 12 categories, each with up to 15 expense items. The calculator even has built-in multipliers for calculating the total cost of an expense from a unit cost. Cool! 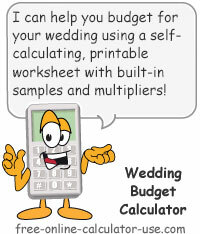 Plus, unlike other online calculators, the wedding budget calculator on this page will give you the option of printing out a customized blank budget worksheet and/or a completed budget spread sheet. You can even choose whether or not you want blank lines to appear on the printed worksheet. 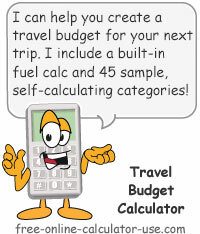 Note that if you would like to budget for your honeymoon separately, be sure to visit the Travel Budget Calculator once you are done budgeting for getting married. Create and calculate a wedding budget, either from scratch or from a sample wedding budget. Enter the maximum amount you plan to spend on your wedding, without the dollar sign or any commas. Preferably you will enter the amount you have saved up for the wedding -- meaning that neither you or anyone else would have to borrow any money to get married (debt can put your marriage at risk). If you and all concerned cannot pay cash for the wedding, you should either wait until you have saved up enough cash, or scale back the size of your wedding to the point that no one has to go into debt on your behalf. Optional: If you want to use the built-in multiplier for bridesmaids, enter the number of bridesmaids here. Optional: If you want to use the built-in multiplier for groomsmen, enter the number of groomsmen here. Optional: If you want to use the built-in multiplier for non-attendant members of your wedding party, enter the number here. The wedding budget calculator will total the bridesmaids, groomsmen, and non-attendant participants to arrive at the size of your wedding party (participants). Optional: If you want to use the built-in multiplier for ceremony guests, enter the number of guests here. Optional: If you want to use the built-in multiplier for reception guests, enter the number of expected guests here. If you would like the wedding budget calculator to populate all categories and item fields with suggested titles, along with a sampling of budget amounts, tap the Load Sample button in this row. Please note that the sample budget amounts are an average taken from a multitude of sources. If you would like to clear the categories, item titles, and expense amounts, tap the Clr button on this row (may also appear as Clear or Clear Worksheet). Expenses: After expanding a category, tap any expense name (or "Blank") to open a popup wherein you can make changes to the name and budget amount. Note that the "Times" field only applies if the "Per -->Times" option is selected. Tapping the "Save" button will close the popup and save the changes to the main worksheet, whereas tapping the "Cancel" button will close the popup without saving the changes. 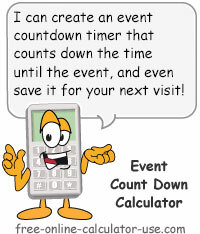 This section of the calculator will keep an updated summary of your entries. This is the budget amount you entered in the top section of the wedding budget calculator. This is the total of all expenses you have entered into the wedding budget calculator. This is the amount you are over or under budget. If the result is preceded by a minus sign, your entered expenses exceed the amount you are budgeting for a wedding. To create a printable wedding budget worksheet, indicate how many blank category and expense rows you want included in the worksheet, and then tap the "Create Printable Worksheet" button. This will open a printer friendly window displaying your current wedding budget worksheet. 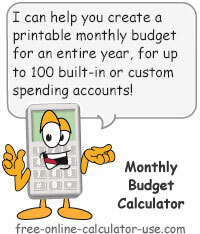 Note that you can create a blank budget worksheet by leaving all of category and expense amounts set to zero. Select the number of blank categories you would like included in the printable wedding budget worksheet. The maximum number of categories that will display in the worksheet is 12. For example if you have 6 categories with entries, but would like two more blanks for later use, select 2 from the dropdown menu. This will include 6 completed categories in the worksheet and two blank categories. If you are printing out a blank worksheet, simply select the total number of categories you would like included. Select the number of blank rows you would like included for each category in the printable wedding budget worksheet. The maximum number of rows that will display for each category in the worksheet is 15. For example if you have a category with only 4 entries, but would like two more blank rows for later use, select 2 from the dropdown menu. This will include the 4 completed rows, plus two blank rows, for the category in the worksheet . If you are printing out a blank worksheet, simply select the total number of blank rows you would like included for each category. Enter the maximum amount of money you plan to spend on the wedding. If you will be using multipliers to budget for participants and guests, enter estimates for the number of bridesmaids, groomsmen, non-attendant participants, ceremony guests, and reception guests. If you would like to start your budgeting with a sample wedding budget, tap the "Load Sample" button and then customize the categories and expense amounts according to your needs. If you wish to create a budget from scratch, change the "Blank" category and expense names to suit your needs and then use the popup expense forms to complete the budget. When you are satisfied with your budget, press the "Create Printable Worksheet" button. This will open a new window containing your completed wedding budget. Don't put your marriage at risk right out of the gate. Don't Be Fooled By "Average Wedding Costs"
While doing the research for this calculator I was amazed at how many websites included the average cost of a wedding in their calculations. Some sites reported an average wedding cost of $29,000, and most even went so far as to base the calculated wedding costs breakdown on budgeting percentages for the various categories. It's no wonder so many couples are spending so much money on their weddings. I can just hear the typical spouse-to-be, "Look honey, our budget is only $25,000. That means we are saving $4,000 dollars!". Well, I hate to be the one to break it to them, but "saving money" is not applicable to weddings. In order to actually save money, a reduction must occur in the cost of an expenditure that is NOT optional. So given the fact that costs for weddings are optional expenses of getting married (except for the cost of the marriage license), this disqualifies them from being a source of any savings. Personally, I see "average wedding costs" as being totally insignificant to the average couple who is budgeting for a wedding. In my opinion there is only one number that should dictate how much a couple should spend to get married ... the amount they have saved up to pay for the ceremony and reception. After all, if they truly want their marriage to last, then one of the worst things they can do is to start out their marriage under the stress and pressure of debt. Depending on who you ask, somewhere around 1/2 of all marriages end in divorce (less for first marriages and more for each additional marriage). And among those divorces, a recent study concluded that in 57% of the cases, disagreements over money was listed as the primary reason for the divorce. The question is, what causes these disagreements over money? The answer, a lack of money. Or more specifically, a lack of discretionary money. Disagreements over money typically arise when there's not enough discretionary income for both partners to get what they want. And the primary reason there's not enough money to go around is because couples typically spend a large chunk of their future discretionary income right out of the gate. They borrow for lavish weddings, dream honeymoons, and cover of Better Homes & Garden houses -- all before the ink dries on their marriage certificate. Then, seven years later when the newness of the relationships and the newness of the dream homes are gone, and the memories of the lavish weddings and dream honeymoons have faded, along comes the future from which they have already spent all of their discretionary income. Talk about bad timing. If you visit a website that's trying to sell you something related to weddings, you will no doubt read the phrase, "Weddings are not for you, they are for others." Really? Here's what I say, if the "others" genuinely cared about you and your spouse-to-be, they would NEVER expect you to do anything that would put your marriage at risk. The truth is, "others" will be so busy running their own lives they will hardly give a fleeting thought to how your marriage is doing. Your wedding day affects only one day of their lives, whereas that day will effect the rest of yours. You are the one that's going to have to deal with the opportunity costs of going into debt for the sake of having a lavish wedding on behalf of others. Opportunity costs? You bet. If you listen to the wedding industry who is telling you that the average cost of a wedding is $29,000 -- which is just an excuse for you to spend that much -- you should also realize that when you spend that $29,000 you are also giving up the right to earn interest on that money ... for the rest of your life. If two 25-year-olds were to invest the $29,000 rather than spend it on getting married, and only averaged a 6% return, by the time they reach retirement age (40 years later), their investment will have grown to $298,285.82. That's the real "average wedding cost" -- all spent for a single day. But even worse than spending that money instead of investing it, is if you put the entire cost of getting married on an 18% credit card and make only the 3% minimum payments. If you did that you would end up spending an additional $28,698.27 in credit card interest charges (see the credit card minimum payment calculator). And guess what you could have done with those interest charges? That's right, you could have invested that money as well. And I'd be willing to bet that you will never be alerted to these opportunity costs from companies who stand to gain from your expensive wedding. Have you ever witnessed a ticker tape parade for a professional sports team that took place before their season even started? Of course not. That's because there won't be any cause for celebration until the team wins a significant title. So why do we celebrate marriages before their "season" even begins? It's because we've been taught to believe that the more we spend on a wedding, the better our marriage will be. Too bad all of the rich and famous celebrities keep proving that theory wrong. The bottom line is this, no amount of money spent on your wedding will insure that it will stand the test of time. But you can be sure that going into debt for a lavish wedding will put your marriage at a higher risk of failing. And for that matter, asking others to go into debt on your behalf may put their marriages at risk as well. But, you say, we only have $300 saved up? Then I say, for the sake of the success of your marriage, you have one of two choices. Either get married in the courthouse, or postpone the marriage until you've managed to save up enough to pay for the wedding that you feel you must have. If you can't save up for something that important, how are you ever going to save enough to pay for all of the other important costs of being married (buying a house, having children, college educations, retirement, etc.)? Now I don't mean to say that weddings are a bad thing, or that nothing good can come from spending a small fortune on them. My only intent is to offer an alternative perspective that I hope will help to offset some of the hype being thrown at you by those who stand to gain from your decisions. My only concern is that your marriage manages to last until death do you part instead of till debt do you part.